Spring is probably my favourite season, I love that the weather is warm but not too warm and that the cold days are not too cold. You get me? I also like that it's the season where everything comes back to life after the cold winter months and seeing daffodils for sale and spring lambs bounding about, I don't know... I just love it. I'm not fond of the cold weather and I don't particularly love Summer because I hate showing my bare arms and legs to the world. I also love Spring fashion and the fact that I can whip out my favourite denim jackets again or go out wearing a chunky knit cardigan instead of wearing a big unflattering coat. So I thought I'd share with you some things I've got my eyes on at the minute in a few places. I'm really loving colour right now and just adding pops of colour into my wardrobe to brighten up my outfits whether it's by adding a bright pair of earrings, a bag and so on. The ASOS Curve Mini Smock Dress does look like something you'd wear to an 80's party but I just love it and it just looks so comfortable and quite flattering too. Following on the colourful theme is the Carbotti Designer Classico Leather Handbag in Purple from online store Attavanti and it is absolutely stunning. It's the most gorgeous eye-catching purple and would definitely brighten up any dull, plain outfit. Attavanti are a family-run business who supply fine Italian leather designer bags including handbags, holdalls, briefcases and more here in the UK. They are strong promoters of the Made In Italy brand and they also ship worldwide. Their main goal is to offer high-quality luxurious bags at a more reasonable price. As Attavanti has grown so has their product offering as they now also sell business and travel goods, scarves, wallets and purses and also technology accessories too. Another colourful one is the Chunky Knit Yellow Cardigan from River Island which has just been added to ASOS. I think because it's styled in a very casual way with a striped t-shirt and jeans on the website is what drew me to it the most. I think H&M are killing it right now, it's just a shame their sizing tends to be way off. But I do like the look of the Floral Flounced Top and I think it's something you can easily dress up or down. Of course, as soon as my eyes landed on the L'Amour T-shirt I wanted to add it to my basket and check out immediately. My love for stripes grows by the day I swear. But I decided because my wardrobe is full of stripes right now to not buy it... for now. I'm also on the lookout for a bigger bag as I'm currently overrun with small bags which only carry a few things and I want a staple big bag which fits everything but the kitchen sink in basically. So I think that a basic black tote bag would be a great go-to everyday bag. I think the New Look Mimi Sweatshirt is nice for more casual days but I do think it's quite pricey for a sweatshirt if I'm being honest. I do have a lightweight parka which I wore literally once last year but it has an embroidered heart on the back and I'm not sure if I actually like it anymore. So I've decided I'm going to pick up a plain lightweight one instead so it goes with most outfits. I also really like the Be Mine T-shirt from H&M (again) I really like pink and red together right now and I just think it's cute. Everyone seems to have the pink River Island knitted cardigan, I know. But I love that it has balloon sleeves and the colour is just gorgeous. I just think it would look lovely with a basic stripe t-shirt and some jeans for a casual look. I'm not 100% sure if the New Look Black floral dress would suit my odd-shaped body but I like the print and it just looks like it would easy to wear and easy to dress up and down. I've also come across the Floral Embroidered bag on ASOS and really love it. It's just so pretty and eye-catching. As you can tell, I'm really liking H&M right now. Their Bee Yourself T-shirt is so cute but I never seem to catch it when it's in stock in XL, sob. It's definitely my type of everyday t-shirt. I'm always going on about Pinafore dresses in my wishlist posts, I know. I still haven't found *the one* but I do like the check print one I've seen on New Look recently but I still want to find a dark denim blue one so that I can basically put together a nice outfit in seconds. I'm also really loving Polka Dot right now, I don't know when it's come from but I'm loving it and I'm definitely going to try out the Polka Dot Jumper I've stumbled upon on ASOS recently. 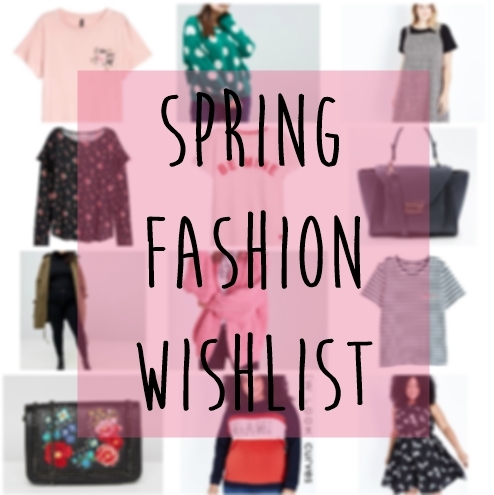 Is there anything that you have your eyes on for your Spring Wardrobe?